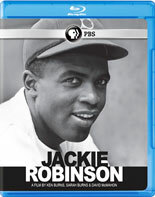 This PBS documentary examines the life and times of Jackie Robinson, who in 1947 lifted an entire race and nation on his shoulders when he crossed baseball'’s color line. The film follows Robinson and his family from rural Georgia and a hardscrabble life of sharecropping to California where he lettered in four sports at UCLA and met Rachel Isum—a nursing student and his future wife. After baseball he was a widely read newspaper columnist, political activist and tireless advocate for civil rights, who later struggled to remain relevant as diabetes crippled his body. Featuring intimate and revealing interviews with his family and rarely seen photographs and film footage, this two-part documentary tells the extraordinary story of an American icon whose lifelong battle for first class citizenship for all African Americans transcends even his remarkable athletic achievements. Produced by Ken Burns, Sarah Burns and David McMahon. Approx. 240 mins. on 2 discs.